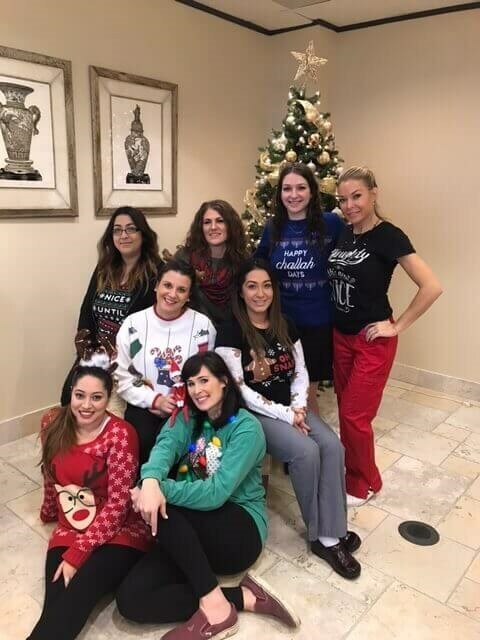 Each year, the fantastic Facial Plastic Surgery Associates staff has fun celebrating the holiday season. Patients enjoy the joyous team spirit that welcomes them at every visit. This year, Amanda, Krystal, Kendra, Brigitte, Ashlee, Stephanie and Alana, wore holiday-themed sweaters to toast the season. Facial Plastic Surgery Associates (FPSA) is the private practice of world-renowned facial plastic surgeon, Russell Kridel, MD FACS. "We are so fortunate to have such a wonderful staff. Their passion and dedication to providing every patient the best and most compassionate care is unprecedented," stated Dr. Russell Kridel and Associate, Dr. Angela Sturm. Facial Plastic Surgery Associates stunning office is located at the top of the 6655 Travis medical building in the prestigious Texas Medical Center. Dr. Russell Kridel and Dr. Angela Sturm are both award-winning facial plastic surgeons. They have published over 120 scientific journal articles on facial plastic surgery procedures such as: face lift, rhinoplasty, revision rhinoplasty, blepharoplasty and browlift.